The muscles that form the back of the forearm are commonly known as Extensor Muscles. These are provided by the radial nerve. Extensor carpi radialis longus (ECRL). Extensor carpi radialis brevis (ECRB). 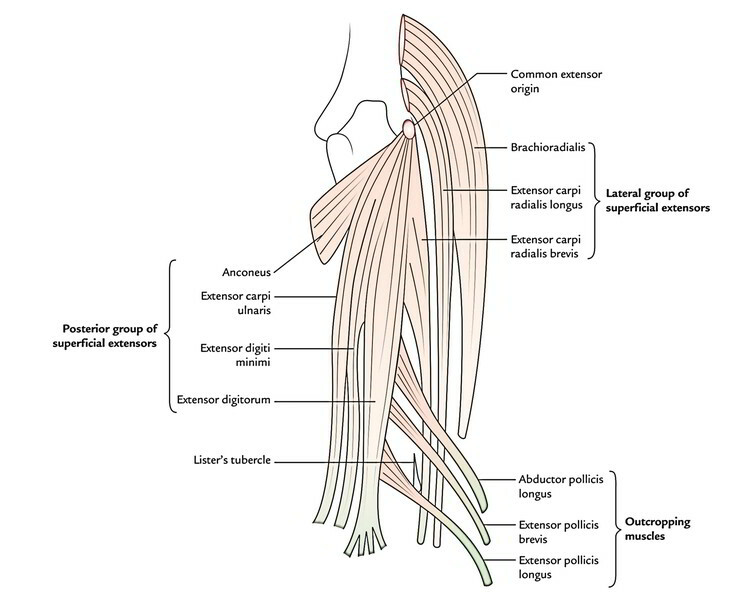 Tendon from the tip of lateral epicondyle of the humerus (known as common extensor origin) commonly give occurance to four of the superficial muscles (extensor carpi radialis brevis, extensor digitorum, extensor digiti minimi, and extensor carpi ulnaris). All the seven muscles cross the elbow joint. Lateral epicondylitis is the overuse syndrome in the elbow. It’s an injury involving the extensor muscles of the forearm. There is degeneration of the attachment of the tendon, placing stress and weakening the site. It’s also referred to as lateral epicondylitis but this is a misnomer because, in general evaluation of the tendons doesn’t show signs of inflammation, but rather degeneration and collagen disarray. Tennis elbow is the most common reason that people see their doctors for elbow pain. It is most common at about any age, although it can come up in people of the age of 40, on an average. Gives rise to four tendons for medial four digits. Lies medial to the extensor digitorum tendon for the little finger. The three deep extensors of the forearm, which function on thumb (abductor pollicis longus, extensor pollicis brevis, and extensor pollicis longus) are located deep to the superficial extensors and in order to acquire insertion on the three short long bones of thumb ‘crop out’ (emerge) from the furrow in the lateral element of the forearm between lateral and posterior groups of superficial extensor. These three muscles are therefore called outcropping muscles. None of the deep muscles of the back of forearm cross the elbow joint. All of them emerge from the radius, ulna, and interosseous membrane. All of them are delivered by the posterior interosseous nerve (deep branch of the radial nerve). Wrist drop, also known as radial nerve palsy, is a condition where a person cannot extend their wrist and it hangs flaccidly. The individual may experience many symptoms including numbness in the wrist and forearm when there’s an injury to this nerve. The individual may find it hard to work with the hand in day to day tasks like objects. There may be weakness. The individual may find it tough to bend the wrist back. Symptoms may include a burning or sharp pain sensations in fingers and the thumb. It is common to experience numbness, tingling, and trouble straightening your arm. You may realize that you straighten or cannot extend fingers and your wrist. This is called “wrist drop” or “finger drop,” and it does not happen in all circumstances. Initial management includes splinting of the wrist for support together with Osteopathic medicine, Physiotherapy and Occupational Therapy. In some instances, operative removal of bone spurs or other anatomical defects that may be impinging on the nerve may be warranted. If injury was caused by pressure from use of other mechanisms of injury or fitted crutches, then the symptoms of wrist fall will resolve within 8 – 12 weeks.